Fixed an error 381 problem when including a Location index. Fixed an error 91 problem when not including any index and no Table of Contents. RTF Font Size - The font size of an event sentence after a previous event's small picture description font was not begin reset to the correct size. Fixed. Web Page - Pedigree style web pages were not displaying mulitple parents correctly in the Family Links box. Web Page - Title wasn't including starting persons name. Parts of their story are familiar, but much has been forgotten. This website sets out what is known of the history of the Scots and Irish of the 1718 migration, and also reminds us of the lives of those who were left behind in Ireland. Sons and daughters and grandchildren of some of the people who arrived in New Hampshire moved on to other parts of America; some of those who were left behind in Ireland, as well as many thousands of people of later generations left Ireland to go elsewhere in the New World. The internet and email may make it possible to pool together knowledge of distant ancestors, so that people from Ireland, America and elsewhere can link up to start to re-create connections between people and places that were sundered almost three hundred years ago. The website has sections on genealogy, as well as links to further information on travel and on Ulster and Scots heritage. Podcast: I am delighted to announce another expansion of this newsletter’s offerings: podcasts. I will now be offering “radio broadcast” interviews of many of the world’s leading genealogy experts. To listen to these interviews, all you need is your present computer. In fact, there is no requirement for new software; you can use what you already have. You can listen to this 9 minute, 47 second story using any modern computer that has either speakers or headphones attached. It can also be downloaded to an iPod or other portable music player. First, a bit of explanation is in order. You may ask, "What's a podcast?" Podcasts are audio programs that are available on the Internet. They are similar to radio programs. Instead of listening to the programs on your radio, however, you listen on a personal computer or on any of several mobile devices, such as Apple's iPod music player. The term podcast, like "radio," can mean both the content and the method of delivery. The host or author of a podcast is often referred to as a "podcaster". A single podcast is loosely similar to one episode of a radio program. New episodes can be made either sporadically or at planned intervals, such as daily or weekly. Podcasts are generally devoted to very specific subjects, such as genealogy or other personal interest topics. Genealogy talk show programs have been available from time to time on various radio stations for years. However, most of these radio broadcasts have disappeared within a year or two. The main drawback of these programs is in timing: they are on the air at the broadcaster's convenience, not necessarily when it's convenient for you to listen. For instance, a genealogy program might be broadcast weekly on a local radio station at 10:00 AM on Saturday mornings. If you have the time available, you can listen to it at 10:00 AM, but only at that time. If you happen to be working, grocery shopping, or otherwise unable to listen to the radio at 10:00 AM, you miss the broadcast. Podcasts are different. They are "broadcasts on demand." That is, you can listen to the podcast whenever you wish, not at the whim of a radio station employee who handles scheduling. If you want to listen at 10:00 AM on Saturday or at 3:00 AM on Tuesday, the podcast is always available and waiting for you. All you need to do to start listening to the podcast is to click your mouse. Another problem with radio station programs is location: you must be within the coverage area of the broadcaster. More than once, I have been frustrated trying to listen to weak signals from distant radio stations. Static, fading, and various noises detract from the broadcasts. In contrast, podcasts are available anywhere in the world if you have an Internet connection. You receive the same signal in New York City as you do in Queensland, Australia. The sound quality is always consistent and clear with no static or fading. With today's technology, podcasts work equally well on dial-up or broadband connections. 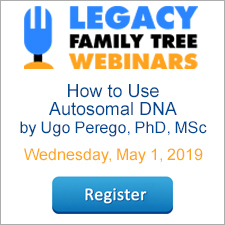 In the case of this e-newsletter, I plan to use podcast technology to offer you something that has not been practical until recently: interviews with leading genealogy experts, authors, lecturers, programmers, software producers, and more. Instead of just reading the words that I write about a particular product, service, or web site, you will now be able to listen to the words of the person or the people who created the service. I hope to interview many leaders in the genealogy field in coming months and to make those interviews available as audio files at www.eogn.com. I hope that you will enjoy listening to these industry leaders as they describe the work they have done and the products and services they have created. Anyone can listen to these interviews. All you need is a computer with either loudspeakers or headphones. Any Windows, Macintosh, Linux, or even most of the handheld computers should work just fine. You won't need fancy or expensive hardware; almost all computers built in the past five years or so will do. You simply go to a podcast listed on http://www.eogn.com and click on an icon, and the interview will start playing within two or three seconds. In addition, if you have an Apple iPod or any similar portable music player that supports downloading of podcasts, you can download the interview while connected to the Internet and then take the interview with you. You can listen to genealogy experts while jogging, biking, walking the dog, or riding the commuter train. This can be an excellent way to use what would otherwise be "wasted time." I expect these interviews to be available on a more or less random schedule. I am not defining a rigid schedule of podcasts in advance. The podcasts will not be broadcast daily or weekly. Instead of having regularly scheduled podcasts, I am planning to make new interviews available as I can schedule interviewees. You might see two or three new interviews become available online one week, but then new podcasts might not appear again for another week, two weeks, or more. I expect that most of the podcasts will be available free of charge. However, on occasion there may be a podcast that is available only to Plus Edition subscribers, depending on the complexity and the expenses of conducting the interview. All podcasts will be available via a link on www.eogn.com. Those who read this newsletter in e-mail will not have any huge audio files attached to those e-mail messages. Instead, the e-mail version of this newsletter will simply show a link that points to the online podcast. You can click on that link to have a web browser open and start playing the podcast. I suspect you will see (or hear) a few rough edges in the first few podcasts as I learn how to optimize the new hardware that I recently purchased for recording these interviews. However, I believe that the quality will improve rapidly in later podcasts. I am excited about the possibilities of podcasts. First of all, it allows me to dust off my long-dormant broadcasting skills. (I used to be a radio announcer many years ago.) Next, it opens a new path of direct-to-you information. You can now listen to descriptions of new products and services, described by the people who know them best: those who created the products and services being described. Finally, the use of podcasts should benefit those newsletter readers who have vision problems. I know from earlier feedback that there are a number of subscribers who are blind or have severely limited vision. If you have limited vision, please let me know how well the podcasts work for you. Regardless of your vision, I hope that you will enjoy these podcasts. As always, your suggestions are welcome. The Census Book, by William Dollarhide, is a comprehensive review of U.S. census schedules that will allow you to take advantage of the research possibilities revealed by census data. It provides many unknown facts and peculiarities about census records that will help your understanding. NOTE: As of March 6, 2008, this book is no longer available. 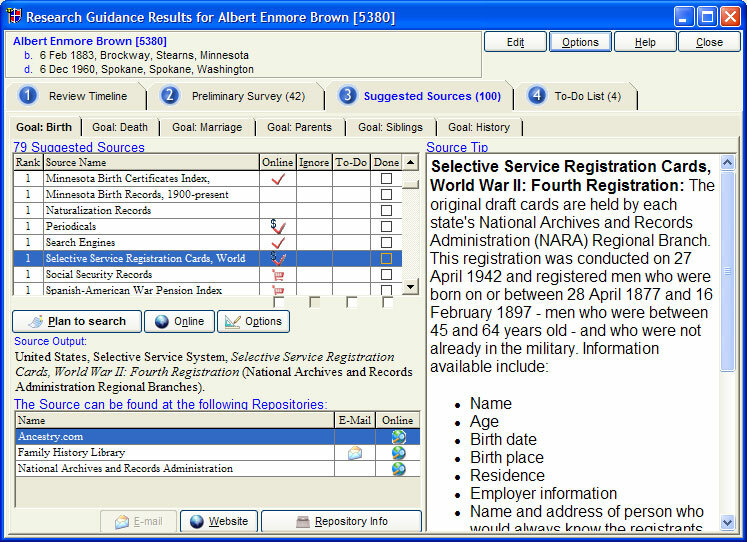 Ancestry has just published the draft cards from the Fourth Registration, or the "old man's registration" for the U.S.'s involvement in World War II. The registration was conducted on 27 April 1942 and registered men who were born on or between 28 April 1877 and 16 February 1897 (age 45-64), who were not already in the military. First, identify your ancestors in Legacy who may be listed in the index. Click on the Search icon, and click on the Detailed Search tab. Add the following conditions, and click Create List. The resulting list includes those men who you should now search for in this new database. In the next update of Research Guidance, you can locate an ancestor and check their Suggested Sources tab to automatically see if they may have registered for the draft. Then just click on the Online button and you're taken directly to the database. 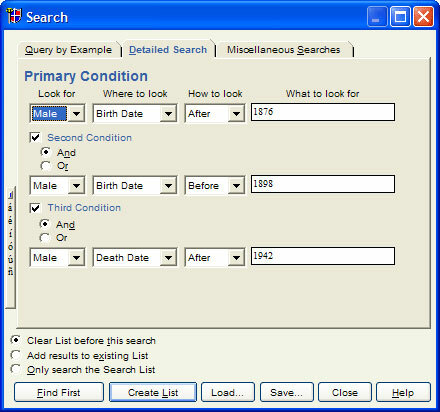 Click here to begin searching the database. 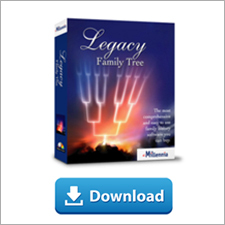 Millennia, developers of Legacy Family Tree will have a booth and will be teaching classes at the National Genealogical Society conference which takes place June 7 through 10, in the Chicago area. The conference will be held at the Hyatt Regency O'Hare, 9300 West Bryn Mawr Avenue, Rosemont, Illinois. We hope you'll stop by with your friends. The exhibit hall is open to the public, FREE! In the current edition of NGS NewsMagazine, Anne McAllister wrote an excellent review of Legacy 6. Although she's been using Legacy for only a couple of months, she provided tips that could benefit all Legacy users. Germany, as we know it today, is a much different country than it was during the time of our distant ancestors. Germany's life as a unified nation didn't even begin until 1871, making it a much "younger" country than most of its European neighbors. This can make locating German ancestors a bit more challenging than many think. DNA Tests - Added support for the Family Tree DNA 59 Marker test and updated a couple other tests.